Column: Rick Priestley, "This gaming life - Any questions?" At the time of writing, my latest game, Beyond the Gates of Antares, has been available for just over a month, which is nothing in terms of a game’s potential lifetime, of course! For its author, it’s likely to be very busy indeed. There are the inevitable questions about the game, the rules, and the background, followed by plans for expansions and model ranges. Feature: Craig Woodfield, "Bitesize battles - The Imjin War"
In 1592, the Daimyo Toyotomi Hideyoshi, Shogun of Japan in all but name, launched an invasion of Korea with the intent to conquer first it, and then China. More than 150,000 Japanese troops smashed aside the Korean defenders and gained control of almost the entire country within a year. However, a highly effective Korean guerrilla campaign and the intervention of Ming China forced the Japanese to retreat to the southern half of the Kor ean peninsula. Feature: Mark Backhouse, "A Macro and Cato committee game - The fight for the third ford"
The Simon Scarrow novels describing the exploits of the Roman veteran Macro and his sharp-witted comrade Cato have been popular with gamers for some time now. While Scarrow’s writing style is not for everyone, I have greatly enjoyed the series, and the books have provided me with some fun alternative scenarios to play out, rather then my normal historical fare. Feature: Joseph McCullough, "Shall we start the bidding? - The Frostgrave auction"
Several miles south of the ruins of Frostgrave is a string of boom towns, which have risen up and expanded to serve the needs of the endless stream of adventurers who make their way to the frozen city. Even though most wizards abide by an unspoken agreement not to wage magical duels in the towns, they are still dangerous, lawless places where gold is plentiful, crime is rife, and nearly anything can be bought and sold. Most of the buying and selling, of course, involves the magical items that come out of the ruined city . Feature: Rob Harper, "Refighting mock battles of the 19th century"
Throughout most of the nineteenth century, regular large-scale mock battles were carried out in parts of Britain, especially in areas which it was felt might be at risk of an attack. The purpose of these battles was to hone the skills of the fighting forces and seek ways of improving training and, where necessary, fortifications. 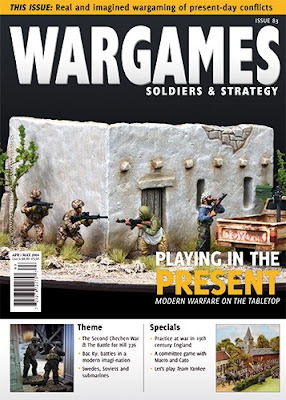 Feature: Jan Kärrman and Michael Leck, "How a game was planned and built for Salute"
Feature: Andy Singleton, "Planning and collecting an army - So wird man Fallschirmjäger"
As someone who paints models all day long for work, the one thing I’m asked most (apart from “How? You have monster hands!”) is how I manage to stay motivated enough to actually finish anything. Well, it’s easy, as it’s my job. However, painting my own stuff is where it’s all too easy to fall down and let things slide. To counter this, over the years I’ve created several tricks to help me complete projects of my own. Theme: Colin Phillips, "Ultra-modern warfare"
In recent years, we’ve seen a rise in ultra-modern wargaming. Perhaps this is due to the increased media coverage of ongoing wars and border skirmishes in Afghanistan, Chechnya, Syria, and Iraq. Modern conflicts have been the most filmed wars ever. The news is full of the latest conflicts and YouTube is full of helmet-camera footage, showing war on the fr ontlines. Theme: Colin Phillips, "The Battle of Abbas Ghar - Operation Red Wings"
Operation Red Wings has been made famous by the book Lone Survivor, written by Marcus Luttrell, and the movie of the same name, starring Mark Wahlberg. While based on true events, there are apparently a number of inaccuracies in both the film and the book. As not everything about this mission is a matter of public record (and we weren’t there at the time), this scenario has been based on both the book and the movie, taking elements from them to create an interesting game. Theme: Eoghan Kelly, "The Storm Gate, Battle for Hill 776 - Grozovye Vorota"
Part of the problem of writing a piece about a battle that took place within the last ten or twenty (or even 40) years is that there are people still alive who either directly participated in it or have been profoundly affected by its outcome, for good or for bad. The distance away from the reader does lessen the effect, and proximity can sometimes extend the memory or heighten the impact. Theme: Steven Wilkie, "Building a modern imagi-nation - Bac Ky - birth of a nation"
The topic of ‘imagi-nations’ is something that many wargamers may have dabbled with to some degree. Often associated with fantasy, sci-fi, and pseudo- historical periods, there seems to be a good number of modern and nearfuture imagi-nations on blogs and forums. This article looks at Bac Ky, a fictional imagi-nation located between Vietnam and China, and pits some of the protagonists against each other in a series of linked scenarios. Theme: Michael Leck, "Soviet submarine stranded in Sweden - Whiskey on the rocks"
On 27 October 1981, submarine S-363, a ‘whiskey-class’ submarine of the Soviet Baltic Fleet, ran aground on the Torhamnaskär reef on the south coast of Sweden, approximately 10km from Karlskrona, the largest of the Swedish naval bases. The ensuing international incident is often referred to as the ‘Whiskey on the Rocks’ incident. Theme: Guy Bowers, "Building an ultra modern army"
Gaming Ultramoderns has many challenges. While we may get snippets of what’s happening on the news, the real events are usually never clear until many years later, if even then. This puts most games into the ‘What if?’ category. Theme: James Graham, "Painting a firefight - Checkpoint ambush"
I was really pleased when Guy asked me to paint a vignette for the magazine. Imagine the scene – a patrol cautiously makes its way forward, only to come face to face with the enemy around the corner of a dwelling. Given that modern firefights are usually long distance affairs, this scenario is perhaps a little unlikely, but it makes for a gr eat front cover theme. Column: Erik Blakeley, "The irregular - A bridge too far"
The American re-enactment scene tends to be the world of ‘Farbies’, which (for those of you who don’t know) is short for ‘Far be it from me to criticize another re-enactor’s interpretation, but …’ For some inexplicable reason, this term is applied to those re-enactors whose kit or appearance does not meet the standards of those self-appointed judges of quality, when it should be a plied to the critics themselves. Hobby: Ruben Torregrosa, "Painting a Spanish caballero - Iberian knights"
I’ve felt tempted to start playing SAGA ever since the game was released. However, Viking-type armies didn’t attract my attention. Then The Crescent and the Cross was released, with plenty of new armies, including the so called ‘Spanish’. Describing them as Castellanos, Aragonese, or just Christians would be more historically correct. Nevertheless, their presence meant that I didn’t have any excuses anymore. Now I simply had to start playing SAGA! Hobby: Tony Harwood, "Building an MDF farm outbuilding - Make MDF look real"
In earlier tutorials, I have attempted to produce something new or unusual, or I’ve selected a subject that stretches my terrain-modelling skills. This time, I’ve chosen a simple MDF building kit from Timeline Minatures. My plan is to build it and try to improve it, or as Guy would say , “Tart it up”. Let's play: Rossco Watkins, "Cold War action from the Flames of War team - Let's play Team Yankee"
The clash of beliefs and ideology that led to the state of paranoia between East and West following World War II, creating the resultant Cold War, fuelled the development of some truly impressive military hardware. From advances in the equipment of the men on the ground to the truly staggering leaps forward in such things as aircraft and their armaments, the Cold War saw the technology advance at a pace (and a cost) previously undreamt of. We can be thankful that these weapons never saw use in the scale of a true World War, but this gives us a lot of really interesting ‘What if?’s. And that’s where Battlefront’s latest offering, Team Yankee, begins. Review: Arvid Kappe, Eoghan Kelly and Paul Burkin, "Game reviews"
In this edition of game reviews, we take a look at 3rd Generation Warfare, Iron Cross and Et sans résultat! Column: Richard Clarke, "Up front - Could less be more?" Misty-eyed for a bygone day I am not. As regular readers of this column will know, I do not look back on my forty years in the hobby and yearn for the glories of the past. Never will you see me hunched over my pint, waxing lyrical on the joys of banana oil and cellulose dope along with the wonders of converting Airfix 7th Cavalry into Mongolian horse archers. The past, as they rarely say, was pretty blooming rubbish.